Jason Gray has big plans. He wants to be the first of his five siblings to graduate from college and start a business. At 25, he’s counting the days until he graduates from John Jay College of Criminal Justice in New York City, where he has about a year before receiving a degree in criminal justice. His plans include launching a career in law enforcement, starting a business, and buying his first home. He’s not short on dreams. What Gray needs is patience. “I’m trying to slow down. I have school, my job, and I want to get the business going,â€ says Gray, who is single and lives in Queens, New York. As if school wasn’t enough, Gray works as an administrative assistant for the New York City Department of Environmental Protection. His annual income: $35,000, including overtime pay. For now, he lives with his mother and assists her with living expenses. He made a conscious decision to save money by not getting a car and instead relies on public transportation. His education is completely covered by financial aid. As for his finances, Gray has about $1,500 in credit card debt and roughly $4,500 total in his checking and savings accounts. He’s open to either starting a new station or buying an established outlet. What’s standing between him and his dreams? Money. Gray says his preliminary research shows that he should expect to pony up a minimum down payment of $80,000 to purchase a small BP gas station. “I know it will take time,â€ says Gray. He figures that once he is a police officerÂ Â he can make about $40,000 a year, plus overtime. So he’s willing to bide his time, foregoing a fancy car, and instead salting his money away. At this point, he says purchasing a house and car would eat up money. “I learned from watching other people mess up their finances. I’m determined not to go that route,â€ says Gray. Build an emergency reserve. Before Gray pursues entrepreneurship or homeownership, he needs to get his personal finances in order. Gray will need at least six to eight months in emergency savings. He should apply the $2,000 contest winnings toward building his nest egg. Prepare for increased living expenses. Gray plans to move out of his mother’s apartment after graduation. Currently, his monthly expenses are $500 to $600 a month. The average rent in New York City is $1,600, according to real estate Website Rent.com. Gray must also take into account additional expenses such as food, utilities, phone, and cable. Gray’s starting salary will be only approximately $7,000 more than his current salary, (average starting salary for New York City police officers is $41,975) and he will face additional expenses, so it would be in his best interest to get a roommate or rent a room in a house. This will help him keep costs at or near the current levels so that he does not overextend himself. Prepare for homeownership. Gray should prepare by paying down credit card debt, keeping a good credit score, and building savings for a down payment on a home. There are special incentives for law enforcement personnel to encourage them to live in the neighborhoods where they work, says Evans-Motte. The benefits could include down payment and closing cost assistance, tax rebates, and reduced interest rates on mortgage loans. Gray should enroll in a homebuying class offered by a HUD-certified housing counseling agency and research first-time homebuyer programs and incentives. Deepen the research. Gray should take the time to research franchise opportunities in other industries and think about whether he really wants to pursue a gas station before making a final decision. Evans-Motte also cautions that Gray should be aware of the costs attached with becoming a franchisee. The franchise fee could be small in relation to the other costs of operating a franchise such as the rental or purchase of the location, the royalty fee (usually a percentage of ongoing sales), regional advertising costs, and required products and equipment. There could also be a personal net worth requirement, which varies by the type of franchise. Potential franchisees typically need a net worth of at least $150,000 or more. However, there are some businesses that might require less. The actual cash requirement could be as little as $30,000 or as much a $1 million for some franchises. 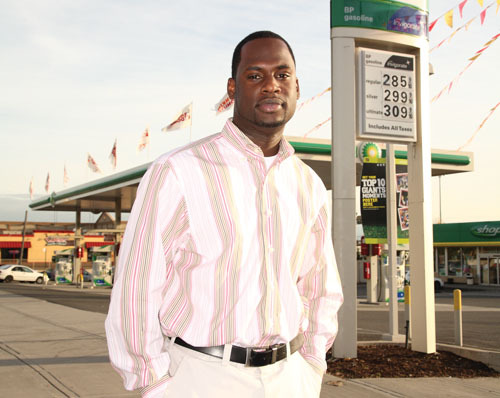 This article originally appeared in the January 2010 issue of Black Enterprise magazine.